Availability of CCS was found by the IPCC  to lower overall climate change mitigation cost to society, based on the results of integrated assessment models. In this presentation, drawing on recent studies [2, 3], we use the integrated assessment model GCAM to explore the ways in which CCS could be used in a future carbon-constrained world, focusing on its possible roles across different sectors ─ electricity, liquid fuels (predominantly, biofuels for transportation), and industry ─ and coupled to different primary fuels (oil, gas, coal, and biomass). To generate scenarios, we assume an increasing economy-wide global price on GHG emissions high enough to match radiative forcing targets, approximating a mitigation pathway that is least cost to society for a given target. The total scale of CCS deployment largely depends on the stringency of the target, with more CO2 stored with more ambitious mitigation. For example, in a RCP 2.6 scenario, GCAM estimates that about 350 Gt of CO2 would be cumulatively stored by 2100, compared to approximately 190 Gt in a RCP 4.5 scenario. Results show that the deployment of CCS technologies is not limited to fossil fuels, nor to power plants. There is potential for significant long-term climate change mitigation from application of CCS in the use of biomass to produce both electricity and liquid fuels [2, 3]. Moreover, in the more stringent climate change mitigation scenarios examined with GCAM (e.g. RCP 2.6 and 4.5), most biofuels and bio-electricity over the century use CCS to reduce their emissions. Our results (see Figure) show a near-term role for some industrial process (such as natural gas processing, and cement and fertilizer production), because of the lower cost of CCS in some instances. This could drive CCS development and technology cost reduction. However, these industrial processes currently account for only a small fraction of global GHG emissions. 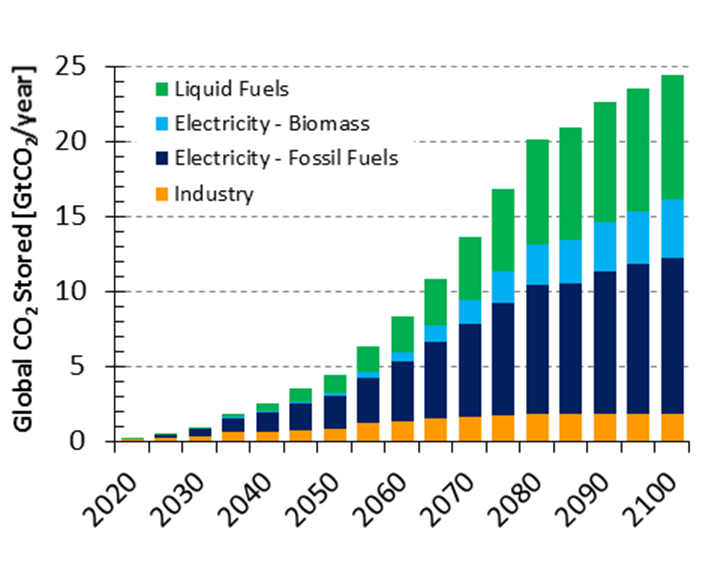 Thus, deployment of CCS technologies at a scale that contributes significantly to long-term climate change mitigation entails large-scale deployment in the power sector and/or coupling to production of biofuels (if biofuel production were to grow substantially in the future), simply based on the projected scale of these sectors . Our results indicate that the use of biomass coupled to CCS in the electricity sector could become significant (reaches 5% of the total CCS applications) around 2050 in the RCP 4.5 scenario. In the more stringent RCP 2.6 scenarios the carbon price is significantly higher, and bio-electricity with CCS is deployed as early as 2030, accounting for about 10% of the total CCS applications . In both scenarios, there is greater deployment of CCS coupled to biomass than to coal, when considering cumulative use over this century . The generation of energy systems transformation pathways over this century is subject to deep uncertainty and entails numerous assumptions. The deployment of CCS technologies competes with other mitigation options on a relative cost basis in GCAM―with climate policy, fuel costs, and technology costs as key factors. The inter-sectoral deployment of CCS technologies in GCAM is found, for example, to depend on assumptions about how future CCS and biofuel technology costs evolve . In the electricity sector, CCS cost adders (i.e. the additional cost implementing CCS at a plant) are key technology parameters, whereas for biofuel production the non-energy costs (i.e. not including the cost of biomass feedstock production and transport) for producing biofuels are more relevant. CCS cost adders for biofuels represent a smaller portion of the cost increase when competing with petroleum-based fuels. By testing the sensitivity of CCS cost adders and biofuel non-energy costs we show that the share of CCS used in electricity generation and in biofuel production (for use primarily in transportation) can vary significantly, as can the share of CCS coupled with fossil fuels versus bioenergy (bio-electricity and biofuels). 1. IPCC 2014, Climate Change 2014: Synthesis Report. 2. Muratori, M., Kheshgi, H., Mignone, B., Clarke, L., McJeon, H., and Edmonds, J, 2017. Carbon capture and storage across fuels and sectors in energy system transformation pathways, International Journal of Greenhouse Gas Control, 56, pp 34–41, DOI: 10.1016/j.ijggc.2016.11.026. 3. Muratori, M., Kheshgi, H., Mignone, B., McJeon, H., and Clarke, L., 2017: The future role of CCS in electricity and liquid fuel supply, Energy Procedia, in press. Figure: Rate of CO2 stored via CCS technologies in a RCP 4.5 scenario, from .